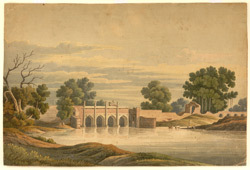 Watercolour by Charles Ramus Forrest (d.1827) of a four-arched bridge spanning a narrow river at Sirhind in the Punjab, dated 1808. This finished watercolour, which may originally have been intended as one of the illustrations for 'A picturesque tour along the rivers Ganges and Jumna in India' (1824), but not subsequently used, shows a camel and rider passing over the bridge with men washing clothes and cattle drinking. The image is inscribed on the reverse: 'Views in India No.38. Antient [sic] Bridge at Sirhind on the borders of the Siekh Country & on the Great road from Delhi to Lahore. built by Shah Acbar-1808', and in a different hand, 'P.Wm Forrest 1864'. Forrest wrote in the above publication, "Our camp...was in front of the ancient city of Sirhind, once so famous for its commerce and manufacturers of silks, and whence silk was first brought to Europe...I rode through its ruins, which are very extensive...The Army moved from Sirhind, and, preceeded by a strong advanced corps, arrived after two marches within about eighteen miles of the Sutlooj river, the first and most easterly of the five which form the Punjab. Our advance was in position on its left bank."